Mr. Townsend has shared his ship building expertise again with us, this time in the form of a 14 gun brig called the Pinnacle. He has displayed some amazing custom sails that look very authentic, and even used 5 different kinds of string to simulate the rigging. The blue flag is a great touch as well. Bow to stern this sailing ship is a masterpiece. To view more pictures of the 14 Gun Brig: Pinnacle check out the forum. After 1,5 years of building, the 20 gun frigate Vesta has finally been completed! The hard work of Admiral Croissant has defenitely paid off. With a great playable rigging, this vessel is truely special. The ship has several nice aspects on board, the ship is modular, that grants the Vesta an interior and playability! A strong crew, some fierce guns and a fast vessel makes this ship a must for every fleet. See the Vesta by Admiral Croissant for yourself in the forum! Posted by Captain Blackmoor in Custom Sails, Ships | Comments Off on Updated HMS Leopard by Captain K.
Being inspired by the movie Master and Commander; the far side of the world and by the new game Napoleon:Total War, Captainkiwi has built an awesome privateer ship. The custom sails, the slanted stern and some other things make it look very good. The name 'Vigilant', meaning 'a watchful eye', really suits this ship and so does the figurehead. Captainkiwi has improved his building skills since his first MOC, the HMS Royale, and with a good result. So check out Le Vigilant by Captainkiwi in the forum! Although the current sail designs are based on the Castle factions, Lamanda takes commissions - got a design in mind? Discuss future designs in the Pirate forum! 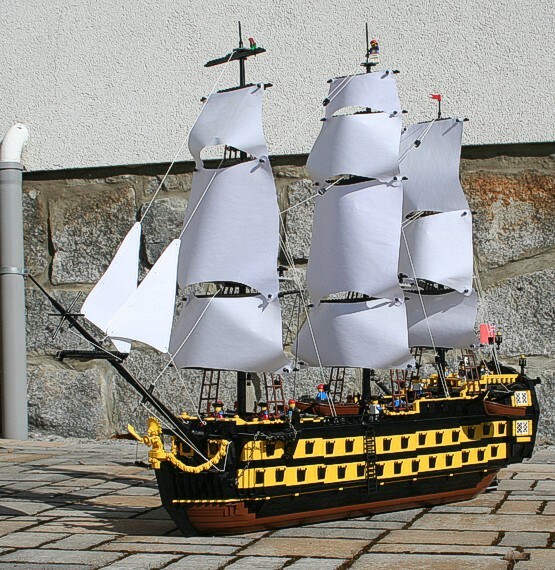 Logbo wasn't quite satisfied with the range of sails provided by LEGO®, so he decided to make his own. It's always nice to see some custom sails, but these are extraordinary! With a brilliantly stunning white and red Imperial pattern and a dark and forbidding Pirate insignia, these sails would fit nicely onto an ship! So head on over to Logbo's Sailmaking thread and check out his custom genius! Have you ever wanted to make custom sails but didn't know how to make them? Take a look at Paul Cantu's handy tutorial and discuss it on the Classic Pirates forum. And yes, it is cheap as well! If you want to see some examples of sails build this way, look at The Avenger and The Acadia at Paul Cantu's MOCpages or discuss this handy tutorial in the Classic Pirates forum.